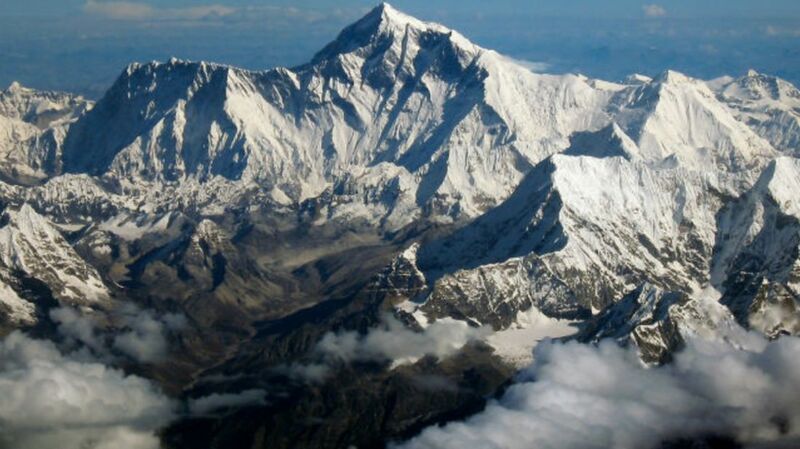 At almost 30,000 feet, Mount Everest may seem like it's as tall and as high a mountain as has ever existed. But the title of Tallest Mountain all depends on how—and where—you make your measurements. Here are three competitors. The dormant volcano Mauna Kea in Hawaii is one of several known peaks that are arguably taller than Everest—as long as you're willing to award the title of "tallest" based on a technicality. Certainly, the highest point of Mauna Kea is definitely not higher than Everest's. At 4205 meters (13,796 feet) above sea level, it's less than half as high as Everest. So why is it such a good challenger for the accolade of tallest mountain? It all hinges on those three simple words: "above sea level." If you discard the water that surrounds Mauna Kea and measure the mountain from its underwater base—a measurement strangely called the "dry prominence," or the solid bottom of all features—Mauna Kea is taller than Everest by almost 500 meters (1640 feet). Starting at the point where Mauna Kea begins to rise out of the surrounding crust, the mountain has a total height of around 9330 meters (30,610 feet). Since no part of Everest is submerged, its dry prominence is the same as its height above sea level. But if you could place the two mountains side-by-side, on a flat plane, Mauna Kea would indisputably be the taller of the two. There are several factors that enable Mauna Kea to be taller than a mountain formed above sea level, but the main reasons are to do with the crust beneath it. Oceanic crust is denser than continental crust and therefore less prone to sag. It's also a lot thinner than continental crust—about 4 to 6 miles thick, rather than 15 to 43 miles like continental crust. By comparison, Everest has the heavy weight of a mountain sitting on top of the already heavy weight of continental crust. Since water is much less dense than rock, the oceanic crust below Mauna Kea is carrying less weight beneath sea level than the continental crust beneath Mount Everest. It can therefore support a higher prominence than would be possible above sea level. If Mauna Kea is only taller than Everest because of a technicality, then maybe Olympus Mons has a better claim to the title. Also a dormant volcano, Olympus Mons is around three times the height of Mount Everest, and there's absolutely no sea water around the base to muddy the definition of where we start measuring its height. But if you're a budding mountaineer looking for a challenge, you might have to wait some time until you try and climb it, because there's one small problem: Olympus Mons is located on Mars. Olympus Mons isn't just the biggest dormant volcano on Mars, it's the biggest yet found in the entire solar system. It rises about 13 miles above the local terrain and Mars's geodetic datum (the local equivalent of sea level), and over 16 miles above the Martian plains. At its base, it covers an area the size of Arizona. But how can it be that big? Maybe it's the result of reduced gravity, or less weathering, or even just luck—but the most likely reason is that the Martian crust isn't divided into plates like it is on Earth, so the geology is a lot more stable. On Earth, when a volcano forms, the movement of the tectonic plates causes it to shift and move until eventually it's no longer being fed pressurized magma, and it stops erupting. On Mars, Olympus Mons remained in a single place for millions of years, growing with each eruption until the Martian core finally cooled enough for volcanic activity to cease. To put that into perspective, Mount Everest has been actively growing for around 60 million years, as the Indian and Eurasian tectonic plates have collided. The eruptions that formed Olympus Mons can be dated back as far as 350 million years, and the youngest parts indicate that it erupted as recently as 2 million years ago. In geological terms, that's relatively recent. Back on Earth, there's one final competitor for Everest's title: Mount Chimborazo in Ecuador. Everest is definitely the highest peak on Earth, and Mauna Kea is arguably the tallest—but Chimborazo is the most prominent, meaning it sticks out the furthest from the surface of the Earth. How does that work? It's all due to the shape of the Earth. Chimborazo itself is only 6268 meters (20,564 feet) high, but it's quite close to the equator. The planet is shaped like a slightly squashed ball, wider around the equator than from top to bottom, and that makes the peak of Chimborazo the furthest you can physically get from the Earth's core while still standing on the Earth's crust. Not even by a negligible amount—by a solid 20,000 feet, which is two-thirds the size of Everest. Everest is still the furthest you can get above sea level, but that's because sea level is affected by the bulging equator as well. In the end, Mount Everest is always going to be the highest point on Earth, and that alone means it'll always have a place in the dreams of those seeking to conquer nature. But next time anyone tells you that Everest is as tall as they come, maybe you'll be able to point out that when it comes to measuring the height of something, while you can't move mountains, you can quite easily move the goalposts.